The message was simple, win and we move on, lose and that’s it for our season. 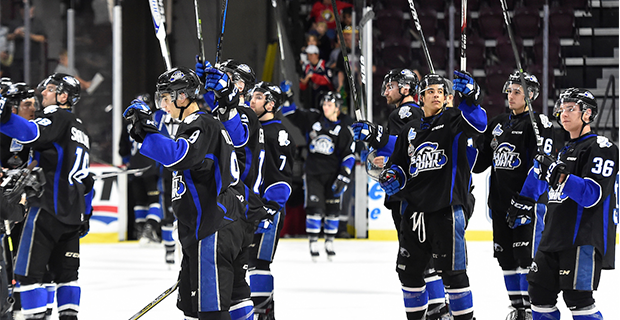 The Sea Dogs got the message and will be moving on to Friday night’s semifinal after disposing of Seattle with a 7-0 shutout victory in the battle of two (0-2) teams. Saint John will now face the loser of the Erie Otters (2-0)-Windsor Spitfires (2-0) contest which will be determined in the last game of the round robin portion of the tournament. With the win, the Sea Dogs rebounded nicely after taking a 12-5 drubbing at the hands of the Otters, 24 hours earlier. After a scoreless opening period in which Seattle outshot Saint John 8-6, Joe Veleno gave the Sea Dogs a 1-0 lead before the ice was dry in the middle frame when his wrist shot from the slot eluded T-Birds goalie Carl Stankowski, 74 seconds into the period. From there, the Sea Dogs exploded for five goals with Chase Stewart, Mathieu Joseph, Spencer Smallman, Cole Reginato and Bokondji Imama lighting the lamp for the QMJHL champions. Seattle made a goaltending change after the Smallman marker but it did not help their cause as Thunderbirds back-up Rylan Toth was rudely greeted by Reginato and Imama. The only highlight of the final frame was Veleno picking up his second goal of the game and third point of the night to put the Sea Dogs up 7-0. The 2000-born Veleno capped of the game plus-5 and was named the second star. Seattle outshot Saint John 31-28 but couldn’t beat Sea Dogs G Callum Booth who stopped 31 shots for the shutout and garnered first star honours. Seattle went 0-2 on the power play. Despite scoring seven goals, Saint John was 0-3 with the man advantage.